3-Point Hitch - The powerful Category II 3-Point Hitch is convertible to Category I easily handles correctly matched Implements. Rigid link ends are standard on the MX4800 and MX5200F models, with telescoping link ends and stabilizers on the MX5200 and MX5800 4WD models, such a great feature. An upgrade kit is available for the MX4800 and MX5200F 2WD models. The telescoping lower links make hooking up and working with large implements easier. Bevel Gear Front Axle - A superior feature that delivers an extremely tight turning radius with full power transfer to the wheels at every steering angle. Cup Holder - To help you stay hydrated, the convenient cup holder will always keep your beverage within easy reach. Draw Bar - The newly adopted drawbar has a 1.3 inch drawbar pin hole that accepts a standard size 2.25" drawbar pin. Easier Cleaning and Maintenance - The new MX Series is designed to make daily maintenance easy. For fast cleaning, the radiator screen can be removed from either side of the tractor. The air filter, battery, tray, and coolant recovery tank are readily accessible. Easy Handling and Maneuverability - Traveling from site to site has never been easier. Both 2-wheel drive and 4-wheel drive models come equipped with a smooth, easy-turn, hydrostatic power steering. Their ideal size and tight turning radius make maneuvering in tight spots a breeze. The brake pedals for HST models are located on the left side for easier operation and smoother turning. Electric-Over Hydraulic PTO Switch - Our new PTO switch makes PTO operation easier than ever. Conveniently located on the right side console, Push and turn starts and one push stops the PTO. Engine Throttle - The handy engine throttle is conveniently positioned next to the steering wheel. Throttle up easily when you need that extra power to get out of tight situations or when hauling that extra load. Gear Drive Transmission with Synchro Shuttle Shift (MX4800/MX5200 only) - Kubota’s Synchro Shuttle Transmission lets you spring into action with smooth control and power. The 4-speed main shift speeds and 2 range-shift speeds (Hi/Lo), give you 8 forward and 8 reverse speeds for the versatility you need to maximize productivity. The shuttle lever is conveniently located at the left side of the seat for quick and easy switching between forward and reverse. It’s particularly handy for tasks that require repetitive forward/reverse motions, like front loader work. Grill Guard - The grill guard provides a robust level of protection and easily tilts forward for opening the hood. High-back Suspension Seat - Work has never been this comfortable. The new suspension seat with a high seatback offers greater comfort and minimal back fatigue even after a long day’s work. The luxurious design is also pleasing to the eye. Large Fuel Tank - The new MX fuel tank is now larger with an ample 13.5 gallons capacity, so you can operate longer with less fill ups. 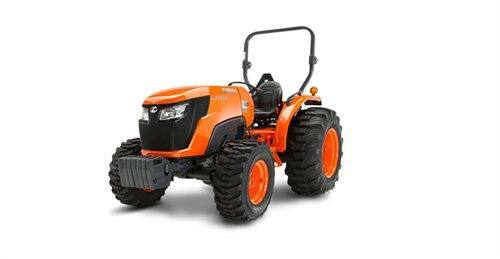 More Powerful and Clean Engine - Kubota takes tractor performance to the next level. In response to growing environmental awareness, the new MX engines also employ a Common Rail System (CRS) and Diesel Particulate Filter (DPF) for cleaner emissions that comply with the latest EPA Tier 4 Final emission regulations, and direct fuel injection for better fuel economy. New Dash Panel - The newly designed dash panel with larger and easy-to-read gauges and digital LCD panel with parking indicator provide all the vital information you need for your MX tractor, including ECU and fault code management. One-piece Hood and Halogen Headlights - The newly designed slanted hood, and new halogen headlights provide a more powerful appearance and better visibility. The full-opening one-piece hood is made from steel for added strength and features hydraulic dampers for easier opening, so you can perform routine maintenance quickly and efficiently. Operator Comfort - Kick back, relax, and get working. The full-flat deck enables safe and easy mounting/dismounting, and the 30 spacious inches between fenders gives you all the room you need to work in comfort. In addition, the easy-to-operate hanging pedals optimize legroom.